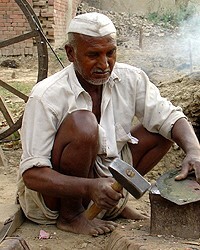 The term Lohar is derived from the Sanskrit word lauha-kara, meaning an ironworker. They have traditionally been a nomadic group, traveling and living in carts. They have at least two endogamous (marry within) subgroups, Gadiwala and Padawala. Each of these subgroups has a number of clans. The Lohar attribute their origins to the god Vishwakarma, who gave them their blacksmithing skills and whom they worship. Their chief deity is Kalkamata, and they also worship Sitalamata and Ram Dev as regional deities. Sacred specialists are engaged from the Brahmin community. They tend to be fervent Hindus. This large people group is spread throughout most all of South Asia, is somewhat nomadic, and speaks several languages. Many Christian workers and many initiatives will be required to communicate the message of Christ adequately to these people. The Lord can raise up the resources needed to reach the Lohar, and we need to pray he will do that. The task is too large for men alone. This people group lives throughout South Asia, and only in Nepal have a few Lohar identified themselves as Christians. Please pray for these Lohar Christians to be joyful in hope, patient in affliction, faithful in prayer, sharing with God's people who are in need, and practicing hospitality. A nomadic group such as the Lohar find it very difficult to properly educate their children, and often have little access to medical care. Please pray these problems can somehow be remedied. 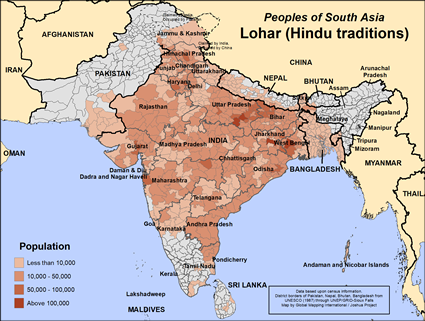 View Lohar (Hindu traditions) in all countries.